Direct Lease Driver of the Month, Jerome Mike, Hampton, Ga., has 20 years of experience as a household goods driver. He maintains a top driver performance rating. 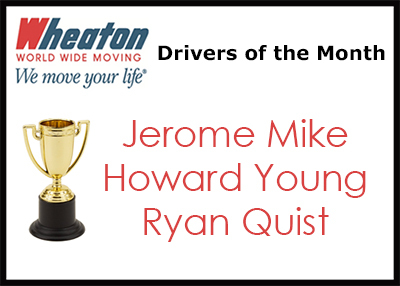 This is Jerome’s sixth Driver of the Month award. He also was selected as Driver of the Year in 2010. Howard Young, Coast to Coast Moving & Storage, Tampa, Fla., earned Wheaton’s Permanent Fleet Driver of the Month award. Howard has 16 years of experience as a professional household goods driver. This is his first Driver of the Month award. Ryan Quist, Quist Moving & Storage, Marshall, Minn., earned Wheaton’s Intermittent Fleet Driver of the Month award. Ryan has 24 years of experience as a professional mover. This is his third Driver of the Month award. Ryan was also selected as Driver of the Year in 2011.